Tripp Lite Switched, Metered Rack Power Distribution Units enable a variety of advanced network control and monitoring functions by giving IT Managers the ability to turn on, turn off, recycle or lock-out power to each individual receptacle and remotely monitor PDU power consumption and in-rack environmental conditions. Switched PDU systems can be accessed, configured and controlled through secure web, SNMP or Telnet Interface. Individually switched outlets can be controlled via a built-in web / network interface, enabling remote reboot of unresponsive network hardware. User defined power-up and power-down outlet sequences ensure proper operation of interdependent IT systems and prevent inrush-related overloads as devices are powered on. Programmable load-shedding of less critical devices at user-defined intervals extends UPS uptime in response to power failures. Unused PDU outlets can be electronically locked-off to prevent powering of unauthorized hardware. PDU power consumption (current) is displayed locally and can be monitored via the web / network interface, with user-defined alarms to warn of potential overloads before critical IT mains or branch breakers trip. 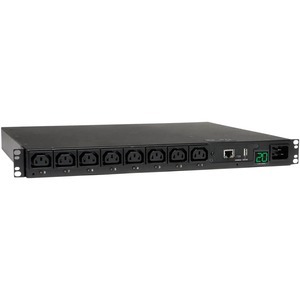 PDUMH20HVNET Switched, Metered, 1U rack PDU supports 20 A capacity at 208 / 230 / 240 V. Includes detachable L6-20P and C19 input cordset options and 8 C13 switched outlets arranged in one unbreakered 8 outlet bank. Visual and remote current monitoring tracks the output current. 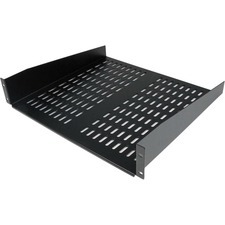 This product supports 1U rack-mount installation in 19 inch 2 or 4 post racks. Included cord retention bracket keeps vital network equipment plugged in and continuously powered.